milk is one of those places that really belongs in l.a. the interior is bright and white, and the place just gleams from the street corner on a cool june night. with its bold red sign, you really can’t miss it driving down beverly boulevard. then upon entering, you become so enamored by the sight of all the different ice cream products that you are confused into paying $3.25 for a scoop. the first time i went to milk, i ordered a scoop of banana dulce de leche and it was pretty good. but it was more banana than dulce de leche, and that’s the wrong side to err on in my opinion. then i stole a taste of my friend’s coffee toffee. it was rich and robust; the coffee flavor really punched through. i was promptly enveloped in jealousy. last night, after all that beer and basketball, we went to milk, and this time i ordered a scoop of coffee toffee. i reveled a bit in the strong, creamy-coffee flavor and the crunchy shards of toffee. then i took a bite of my friend’s strawberry shortcake ice cream bar. one little bite and the strawberry flavor swept my mouth, and there were delicious little crumb clumps embedded in the coating, too. i was promptly enveloped in jealousy. now guess what i’m determined to get next time. this is going to be a vicious (delicious!) cycle. milk also has a substantial food menu (i was intrigued by the crispy skin ½ chicken i saw scrawled on the specials board) and a side case of baked goods (their blue velvet cake is pretty popular, i sense), but if i’m going to bookmark this place for anything it’ll be for the ice cream. you can justify plunking down a fistful of dollar bills for homemade ice cream if it leads to a night of thrilling conversation, right? now, you tell me: would you rather date a guy with a comb-over or a guy who’s 4’11”? or: a girl with a moustache or a girl with four missing teeth? we sat outside in those metal chairs till closing time hashing these complex issues out, and it just wouldn’t have worked without the ice cream. there was some kind of basketball game going on yesterday. the bar was packed. purple and yellow everywhere. people cheered… and i sat quietly at our table, facing “the wrong way,” admiring my pretty pretty beer. we had gone to yard house early and claimed some seats outside. since we knew we were going to be camped out there for a few hours at least, my friend suggested we pace ourselves with the ordering of food and drinks and order a little at a time. oh, you mean i have to sit here and try a bunch of different appetizers? and i have to keep ordering drinks? and plates will continue arriving throughout the evening? hm, interesting. perhaps i like this “watching sports” thing. i eventually got around to trying one of yard house’s beer blends: the youngberry chocolate. it’s a half-half combo of lindemans framboise and young’s chocolate stout. i’d seen this on the menu before and always thought it was kind of gimmicky – one of those things that only sounds appealing. and i love the framboise on its own (meets my very strict tastes-like-juice criteria for alcoholic beverages), so why mess with it? plus, i don’t even like chocolate with raspberry in real life. but when my drink arrived, i …uh, kind of sucked it down. it was pretty delicious. what makes the blend a great idea is the fact that the creamy stout offsets the acidic pucker of the lambic and adds that velvety layer of foam on top. foam, foam, foam, i love foam. i may not have come away from last night caring any more about basketball than i did before, but youngberry chocolate: i smack my lips at you. why, yes, strange sir, it is. i go back to my car now and eat with my friends at señor fish, ok bye bye. before i even left the house to head to lamill, i had my heart set on the house-made brioche donut holes that i kept hearing about. with a strong, rich cup of coffee – nothing sounded better to start a leisurely day off. when i sat down to order, though, i received the heartbreaking news from the waitress that they had just run out. oh well. i was hungry for lunch anyway, so i ordered a panini and a café con leche. …and settled in at my table outside. yesterday evening, in a lull between errands, i opened all the windows wide and sat down on the couch with the may issue of sunset. there must have been something about the balmy evening air or the fact that summer is oh-so-close, because flipping through the pages soon had me dreaming up all sorts of pleasant possibilities for the coming months. i took out my pretty little notepad from my purse, one i bought on a whim while i was in boston last month, and scribbled down notes and addresses in a happy frenzy. my findings were as follows. enjoy! an article about exploring the l.a. river by bike included a blurb about l.a. bread, a bakery on los feliz blvd. i say skip the bike riding and head straight for those caramelized banana pancakes. priorities. please. i’m not much for wine, except for the dessert variety, so when i saw one on their list that was a blend including muscat: hello, pen on paper. and ten bucks, at that! it’s a house white from the magnificent wine company. i hope it’s good, so that i can realize the vision i have in my head of languishing beneath a shady tree with a glass of it in my hand, bowl of strawberries at my side. a pretty pretty picture renewed my fascination with macarons and nudged me again towards paulette, a bakery a friend had gushed about months ago. and the last item on my list: “make limoncello?” i’ll let you know how that one goes. oh man, have i failed to upkeep. so much has happened just since the last time blogging – rang in the new year with a home-cooked meal and multiple bottles of champagne with friends; found out one of my dearest friends is preggos; and celebrated the end of cc’s bachelorette days with a wild weekend. i guess i’ll back track to the time when i last updated this thing, starting with mf and i celebrating our anniversary at fleur de lys. it’s a restaurant i’ve always wanted to try, but was always lured away by the newer, trendier restaurants. 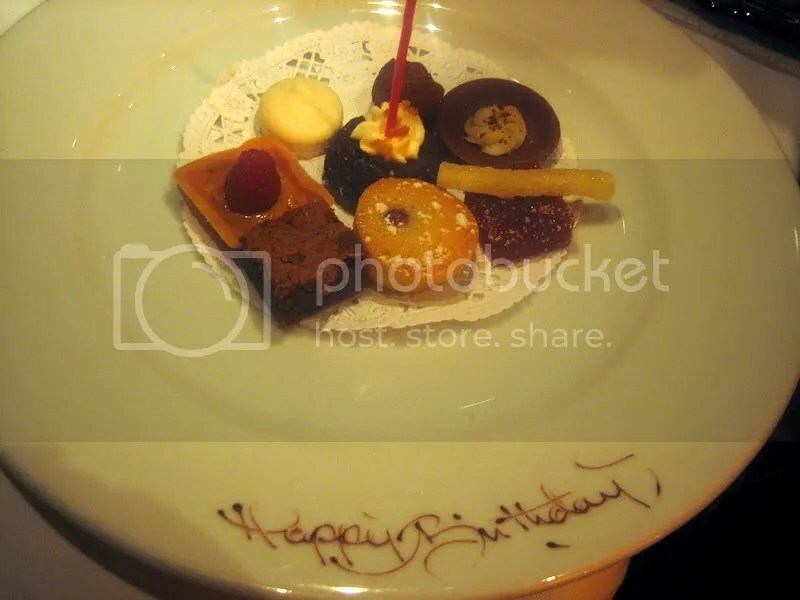 this place is not trendy at all – it’s very traditional and classic french both in ambiance and cuisine. We started off with a mini corn bread and shooter of split pea puree, butternut squash puree, and creme fraiche. the flavors of the shooter was an interesting mix, perfect for whetting our appetite! next, we had a small dish of roasted endive with duck, mustard seed (which mf immediately recognized because of his strong aversion), chives, and a jalapeno brioche. i thought it was okay overall, but the mustard seed and endive left a funny sour aftertaste in my mouth. for our appetizers, i had fois gras again! It came with ragout and corn and truffle popcorn! i always love me some fois gras, but i can only take it in small doses. this portion was definitely more palatable than the portion at gary danko! 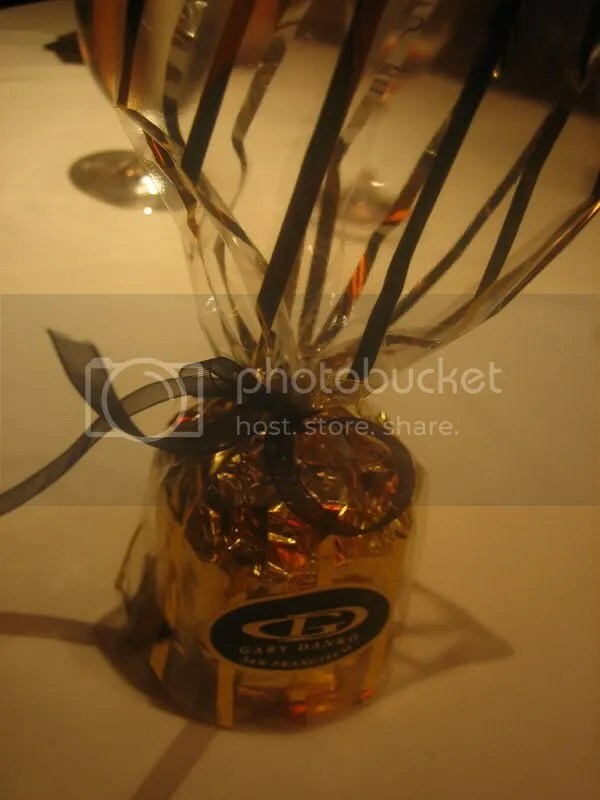 it also came with a cute little bucket of extra truffle popcorn! adored it! mf always seems to gravitate towards lobster dishes, and this time was no exception. the roasted main lobster was amazing, served with lemongrass and pomegranite. the lobster was so buttery and the pomegranite seeds were like little surprise bursts of sweet/citrust in my mouth! 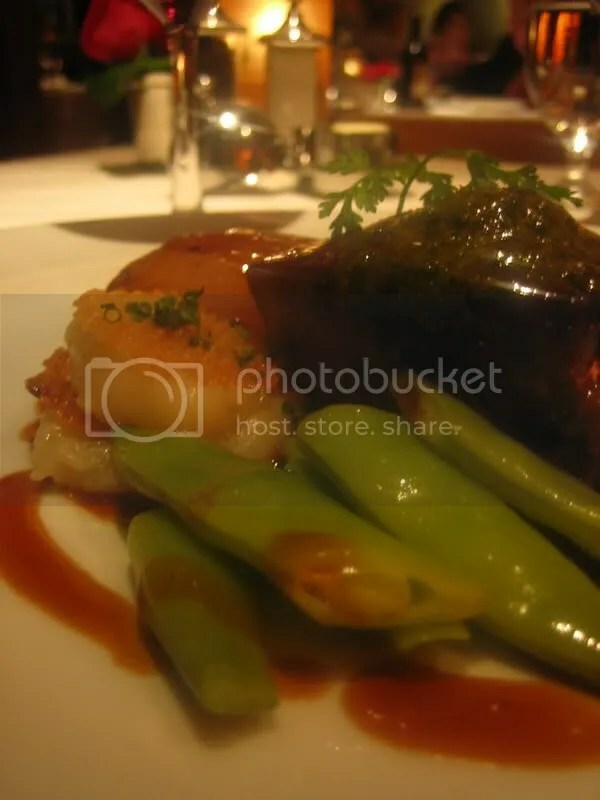 …which is why i kept taking bites of mf’s filet mignon with lobster claw, and mac ‘n cheese stuffed brioche. the mac ‘n cheese was delicious, but then again, it would be hard to screw up mac ‘n cheese. the best part of dinner this time was the dessert! chocolate souffle that looks very similar to gary danko’s, but imho was no where near as good. my dessert on the other hand, was the highlight of the meal. i knew about their fleurburger and knew i wanted it without even looking at their dessert menu! there was a mini chocolate banana “milkshake” that was sooo yummy i chugged it down in 2 seconds. okay, i left some for mf to try and he really liked it as well. the “burger” part consisted of a small beignets as buns and chocolate ganache as the “patty”. i don’t recall what the “cheese” was, but the “tomatoes” and “kiwi” were thin slices of strawberry and kiwi, respectively. and the “pommes frites”! oh my lordy – little strips of frozen fennel ice cream…. the whole thing was so divine i inhaled it even though i was STUFFED. after dessert i felt like i had absolutely no room in my stomach, but somehow made space for a few bites of our chocolate mousse “happy anniversary” cake and tray of petits fours! the highlight of the night? making friends with a couple sitting next to us, celebrating their thirty or forty something wedding anniversary. they were so bubbly and chatty, and even asked us which anniversary we were celebrating. i felt kind of silly when i told them, but the lady was like “puh! most people don’t even make it that long!” despite being complete strangers, they were so happy for us and gave us such encouraging words! they said they had been together since 18 and had lived together for a long time (i forgot exactly, but something like 15 years) before they got married. to see the passion so alive still was really inspiring! i really aspire for my love to be like theirs. we are lucky in life to find great loves, but to achieve and maintain that kind of long-lasting, strong bond takes more than luck – it takes a lot of hard work over time. anyone who’s eaten with me more than twice will notice a pattern. i never finish a meal. 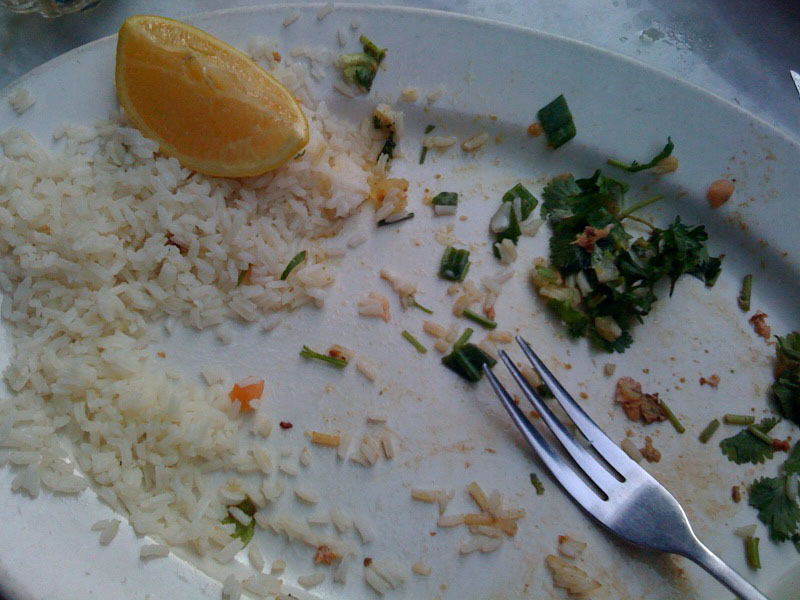 or rather, i always finish a meal – but it’s about a day or two late, in the form of leftovers eaten at the next meal. i don’t know when it happened – perhaps some time after i graduated from college and eating as a social activity waned dramatically – but my stomach shrank. at this point, it’s probably the size of your little sister’s fist. 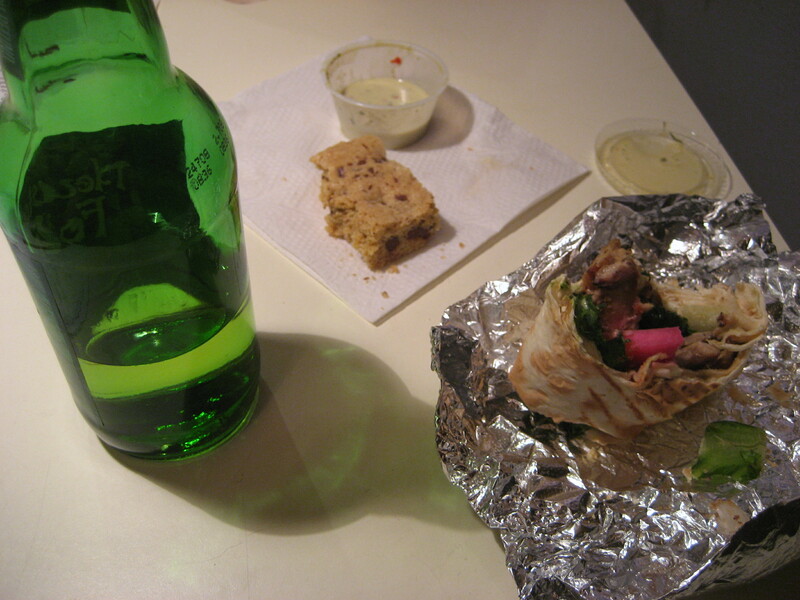 a few inches of apple cider, the stubby stump of a chicken wrap, and the last two bites of a chocolate chip bar. and i couldn’t go further. i don’t know why i can’t eat like a normal person. but i suppose that just makes last weekend all the more extraordinary. this is my first official time writing here, and what better way to kick off the blog than to share my recent memorable dining experience! 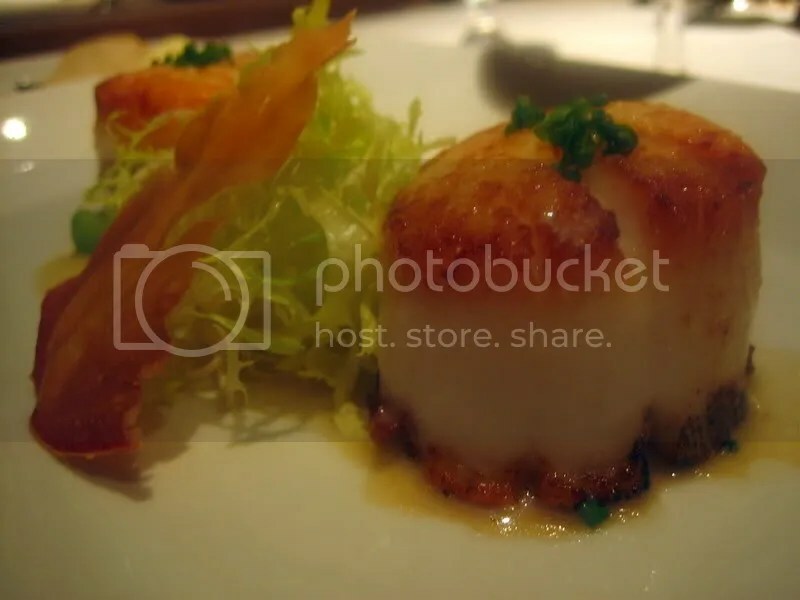 it was a couple weeks ago at gary danko, a restaurant i’ve been wanting to try for a long time. well, an occasion finally arose for me to go and let me say… i’m already excited to go back! to put in context, it was the man’s birthday and i had had to call exactly two months ahead of time to secure a reservation at a decent time! i didn’t mention making birthday plans to him, as i wanted it to be a surprise. a few hours prior to dinner on his birthday, we went out to happy hour with some friends. i thought he was just going to sip on some margaritas but to my HORROR , he started finishing about 3 too many drinks and also ordered a HUGE plate of nachos! finally, when i could stand to watch no longer, i put my foot down and told him firmly, “NO MORE NACHOS!” this confused him, since i am not one to ever control his food intake. when we finally arrived at the restaurant, he was totally surprised, which made the inconvenience of being secretive worth it. in terms of ambience, it was a lot more crowded and louder than i thought it would be – but i actually prefer that to most quiet, stuffy restaurants so i didn’t mind at all. being the gluttons that we are, we both ordered the summer tasting menu with wine pairing and substituted some of the courses. 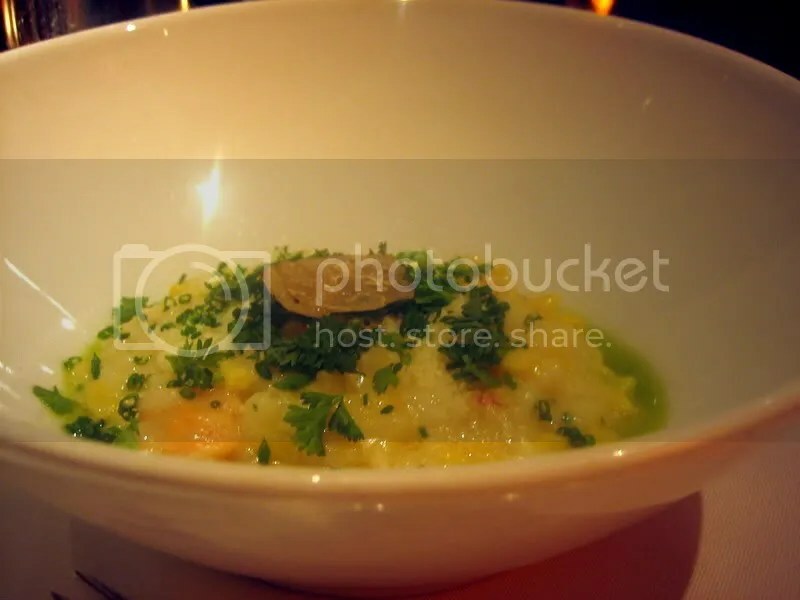 one thing i loved about gary danko is they let you “mix and match” the courses. theoretically, you could have 5 appetizers in a row and they’ll adjust the portions accordingly. before the first course came out, our server (very friendly all through the night, btw) came with an amuse bouche, a cool asparagus soup of some sort. it was very refreshing and perfect for whetting our appetites. 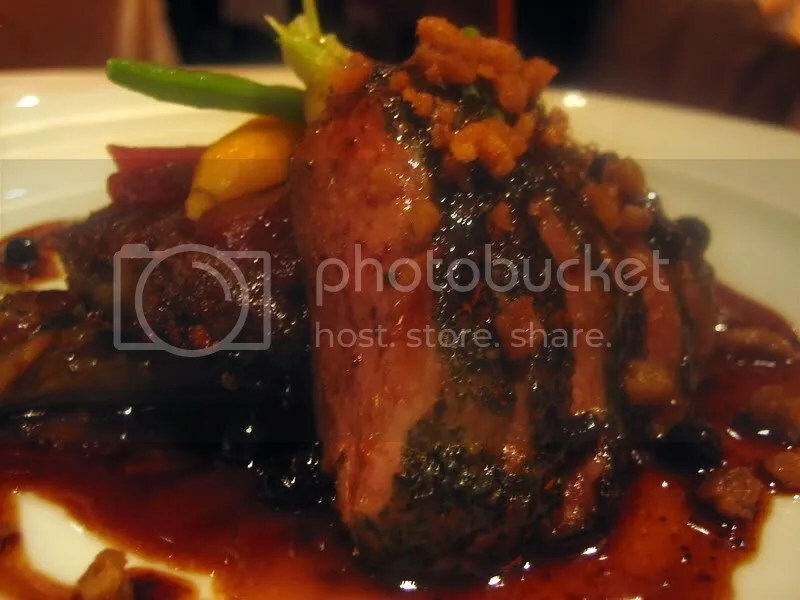 for the first course, i ordered the seared sonoma foie gras with caramelized red onion and nectarines. 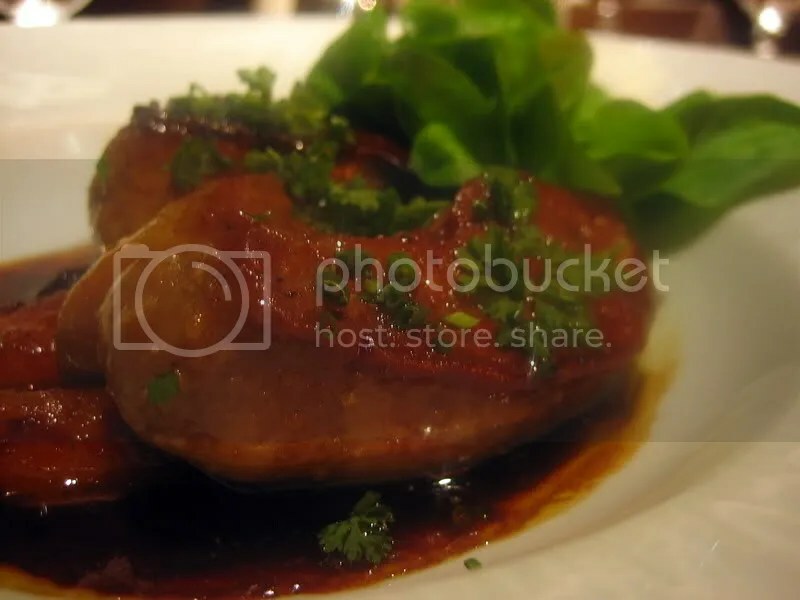 we were both taken aback by the huge portion of foie gras, but it was delicious – so tender it melted in my mouth. ahh, like butter. the sweet wine that the sommelier paired with the foie gras went together more harmoniously than any other wine with other courses, and i’m slightly sad i don’t remember the name of the wine! 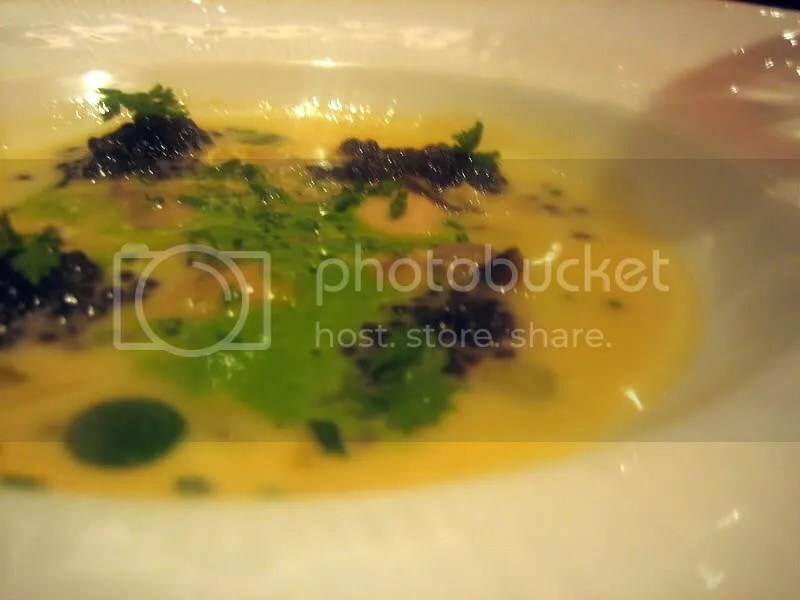 he stuck with the traditional first course meal, which was a soup with glazed oysters and osetra caviar, zucchini pearls and lettuce cream. i personally love caviar, but mike felt it slightly salty. then came the second course. i had seared sea scallops. again, both of us tried this and loved it. it had hearts of palm, fava beans, frisee and prosciutto, and anyone who knows me i love almost anything with prosciutto!!! the meat course was next and he had a lemon pepper duck breast with duck hash, bacon braised belgian endive and huckleberry sauce. he loved this dish and i thought it was pretty good, but not orgasmic. i had a filet of beef with potato-leek napolean, cassis glazed shallots and basil butter. the meat was very tender and had so much flavor that even though i was full already, i managed to almost finish the entire thing. the cab that the sommelier paired with this was just icing on the cake. it wasn’t until mike said “you know, you don’t have to finish that whole thing if you’re too full” that i finally put down my fork in defeat. 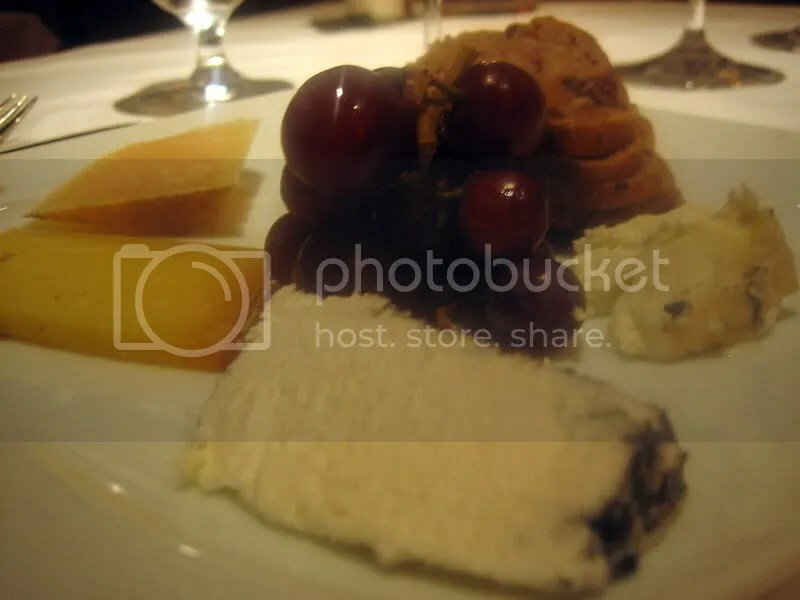 by this point, we were stuffed, but bravely accepted the next course – the cheese plate! gary danko is known for their cheese course, and i being a total cheese freak i was looking forward to this all night long. we each picked four cheeses and managed to at least taste each of them. 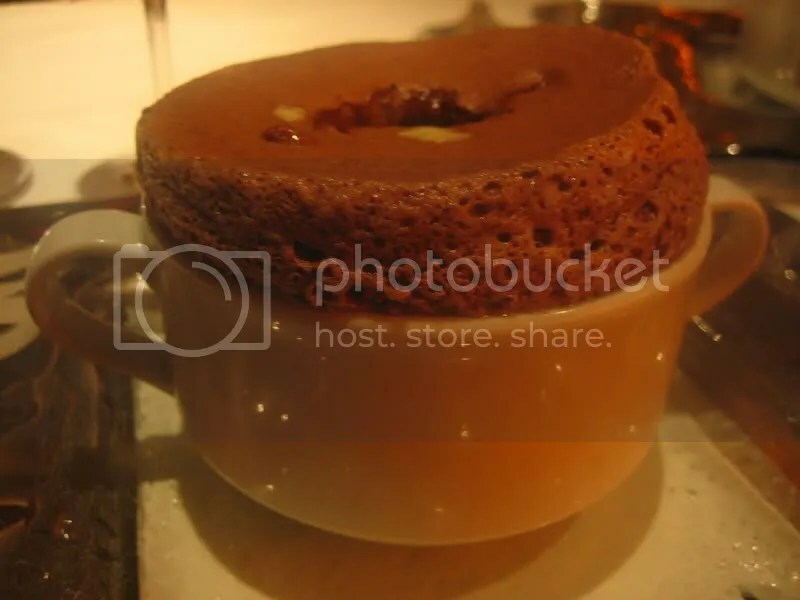 for dessert, we both got the chocolate souffle, also another signature dish at gary danko. our server came to us with the souffles and poked a hole in each. he drizzled two sauces – a creme anglais and a dark chocolate sauce – in each. this, along with the sweet mas amiel – mmm!!! 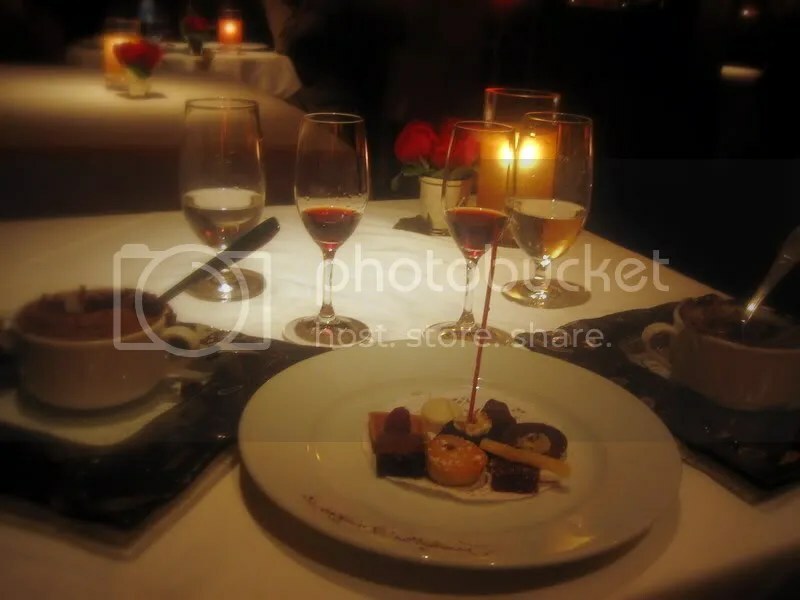 the experience at GD is going to be remembered fondly for a very long time – not just because the food, wine pairing, service was perfect, but because i was in good company and it was a great celebration. seeing mike surprised and having a good time makes me happy. if only i wouldn’t be burning a serious, serious hole in my wallet and ensuring a heart attack by 30, i would be back there every month. i know he doesn’t particularly like celebrating birthdays and has told me before he’d be happy ordering roundtable pizza and calling it a night. so he was particularly pleased and thanked me multiple times – but little does he know… i probably enjoyed his birthday much more than he did! in fact, i should be the one thanking him for being born and giving me an excuse to visit restaurants! :D THANKS MIKE!! !